Thai chicken and rice is the focus of both East Bay restaurants, but there's more to love beyond the signature dish. 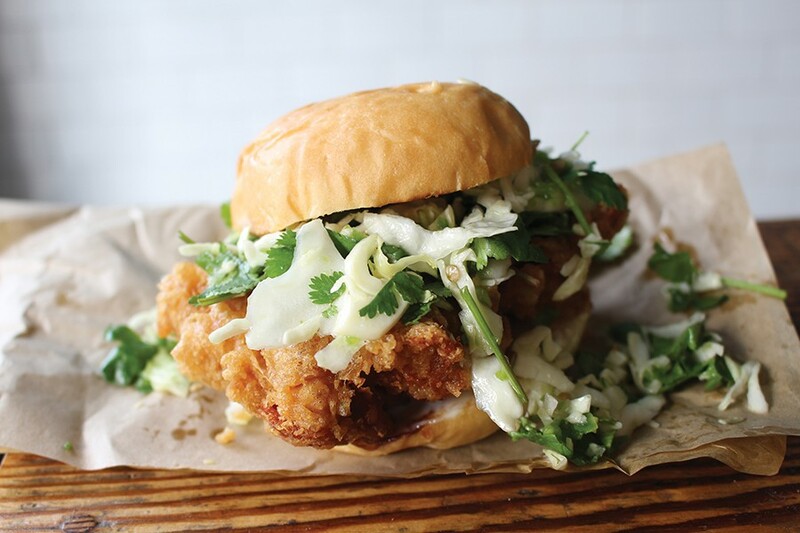 Hawking Bird stands out with its fried chicken sandwich, finished with a minty slaw and chili jam. In 2017, khao mun gai went from an obscure, Thai interpretation of Hainanese chicken rice — Singapore's national dish with Chinese origins — to something far more locally famous than the original. 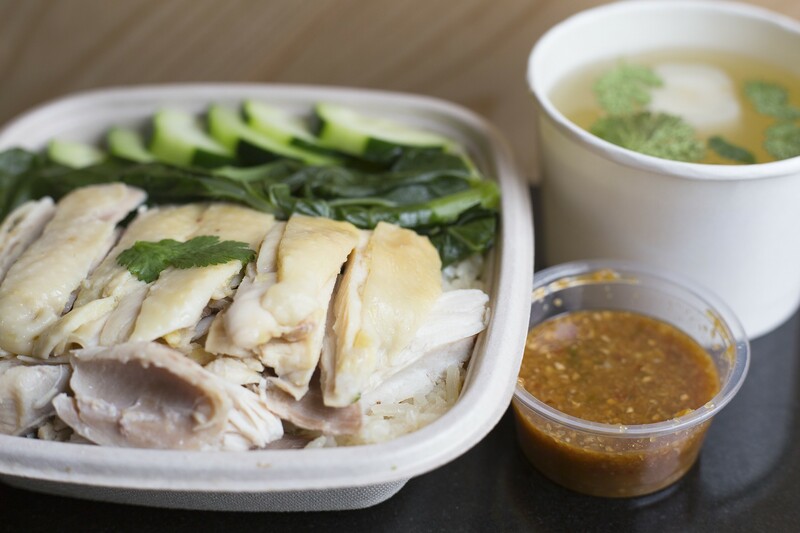 The main components are poached chicken, rice cooked in chicken broth, a soybean-based sauce, and a cup of chicken broth on the side. With its beige color palette, room-temperature meat, and soft skin, khao mun gai might not immediately excite the masses, but it's a comforting dish with a cult following and plenty of rewards for those who appreciate subtlety. Many East Bay residents were first introduced to khao mun gai at Oakland's Hawker Fare. Now, such chicken and rice can be found on the menus of modern Thai restaurants all over the Bay Area — San Francisco's Kin Khao, Berkeley's Funky Elephant, Oakland's Soi 4 Bangkok Eatery — and, more recently, at spots specifically built around khao mun gai. In the East Bay, we have two: Hawking Bird in Oakland's Temescal and Chick'n Rice in downtown Berkeley. Three-month-old Hawking Bird is James Syhabout's fast-casual, Hawker Fare spin-off with a full bar. Chick'n Rice, meanwhile, comes from four founders of Caviar, the food delivery app, who have immediate expansion plans. Just eight months after it debuted in Berkeley, another location is scheduled to launch in San Jose soon. Both restaurants offer a few, Thai-influenced entrées apart from khao mun gai in cute, colorful spaces with on-trend branding, representing a new fleet of restaurant concepts launched with delivery in mind. Let's start with the khao mun gai. Both renditions are worth trying, but Chick'n Rice has the edge. Executive chef Gregory Delgadillo slowly poaches whole birds, removes the bones, and portions out a mix of dark and light meat for each order. The result was a dynamic mix of flavors and textures, all the while soft and silken from the delicate poaching. The Jasmine rice was full of chicken and ginger flavor while maintaining its bite. Pumped with vinegar, garlic, and Thai chilies, the fermented soybean sauce packed a wonderful punch. And the steaming broth felt both clean and luxurious in its fattiness while an untraditional puck of daikon, resting beneath the surface, provided a little unexpected sweetness. At Hawking Bird, Syhabout poaches whole thighs only, and I suspect he does so slightly faster than Delgadillo, as the chicken was slightly chewy and lacked that characteristically lustrous feel. Still, it tasted tender enough tossed with Hawking Bird's formidable, funky sauce. Injected with a surplus of chicken fat, the Jasmine rice took on the flavor but also became softer and somewhat clumpy. I wished Hawking Bird automatically served soup on the side — it feels not only customary but crucial for the balance of the experience — but you can add it for $1, piping hot and finished with scallions. Where Hawking Bird truly stands out is with its fried chicken. Syhabout marinates chicken thighs in garlic and ginger, dips them in a rice flour batter, and double fries them until they're superbly light and crispy. My favorite way to eat it was sandwiched between toasted, buttery egg buns with a crunchy cabbage slaw — bright with lime juice, chilies, cilantro, and mint — and charred chili jam, a condiment so excruciatingly delicious that Syhabout should seriously consider selling it by the bottle. I also loved it paired with sprouts and mixed greens dressed in a tangy tamarind-lime vinaigrette. The vegetarian version was also fantastic: lightly curried, fried, and creamy Hodo Soy organic tofu, smeared with more of that funky, smoky chili jam, rested alongside roasted cauliflower, fried garlic chips, and sesame seeds. It was remarkably soulful, layered, and nuanced for something that could be described as blandly as "tofu salad." Khao mun gai stars at Chick’n Rice, fully equipped with soup on the side. When Chick'n Rice first opened, it had an even smaller menu than Hawking Bird: khao mun gai, a version with fried chicken, a version with tofu, and khao kha moo, Thai braised pork. The khao kha moo makes the strongest case for skipping khao mun gai entirely at Chick'n Rice. The soy sauce-perfumed, fatty pork comes out almost jammy in its softness, served with its glossy, gelatinous skin as well as zesty greens, rice, and a perfectly gooey egg marinated in soy sauce. The fried khao mun gai offers a nice change of pace — all the fixings of the original, but with crunchy, panko-breaded chicken, similar to an excellent, Japanese chicken katsu. I also thoroughly enjoyed Chick'N Rice's lone dessert, ice cream loaded into a plastic cup with mango chunks and warm, sweet sticky rice. Go for coconut. In January, Chick'n Rice expanded its menu with a list of rotating specials. It's the vision of Delgadillo, who was brought on from Michelin three-star restaurant Saison about six months ago to tweak all the recipes. While I admired his attention to detail with his adjustments to the main menu, the specials I tried were largely misses. The Thai fried rice was bland and boring, and I struggled to get through the KMG Roll, a burrito-sized spring roll of poached chicken and vegetables wrapped in rice paper. It looked lumpy and tasted like a poor, dry attempt at chicken salad, but most egregiously, the rice paper was waxy and tough. Delgadillo said he's already toying with a new round of specials, and similarly, Syhabout is working to expand Hawking Bird's offerings. He recently added tuna poke — fitting with the bird theme, he notes it's "the chicken of the sea" — and plans to fill out the side options with more vegetables. Right now, it's a carb-heavy list, so I appreciate his efforts to lighten things up. Hawking Bird is also where you'll want to go if you're gluten-free, as Syhabout has taken to care to make sure most of the menu — including the sauces — spares the gluten intolerant. If you like booze with your meals, Hawking Bird's full bar will look extremely attractive, and the staff whips up an intriguing mix of vintage, modern, and vaguely tropical cocktails. Chick'n Rice plans to add beer and wine down the line, but for now, the only mixology you'll get is Thai iced tea topped with whipped coconut cream. If you generally care about the environment, Hawking Bird is the better choice, too. While both restaurants automatically serve everything in to-go containers, Hawking Bird's are all compostable and Chick'n Rice creates some unnecessary trash in favor of more Instagram-friendly wooden boxes. Hours: Tue.–Thu. 11:30 a.m.–9:30 p.m., Fri.–Sat. 11:30 a.m.–11 p.m., Sun. 11:30 a.m.–8 p.m.